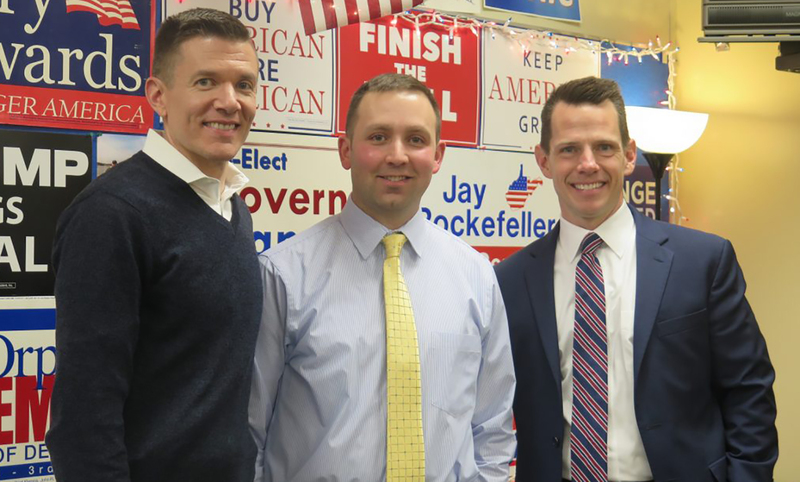 West Virginia Sen. Ryan Weld, R-Brooke, left, Wheeling Park High School history teacher Ryan Stanton, and Sen. William Ihlenfeld, D-Ohio, look at Stanton’s collection of political signs after the senators addressed his class on Monday. WHEELING, W.Va. — West Virginia needs teachers, and some students at Wheeling Park High School indicated Monday they might consider education as a career if the pay were better, and there were financial incentives in place to help pay for their college tuition. West Virginia senators Ryan Weld, R-Brooke, and William Ihlenfeld, D-Ohio, addressed students in history teacher Ryan Stanton’s class Monday. They sought the students’ input on what the Legislature can do to improve schools as they prepare for a special session on “the betterment of education” in West Virginia. The students spoke of how in some classes they have permanent substitute teachers as the school district continues to seek permanent qualified teachers for vacant positions in math and science classes. The West Virginia Department of Education reports more than 700 teaching positions remain vacant across the state.